By downloading and/or installing a Durotype font, you (or you on behalf of your employer) agree to be bound by the terms of this agreement. This agreement, in conjunction with the receipt that accompanies each purchase from Durotype or its distributor, constitutes the complete agreement between you and Durotype or its distributor. You may use a Durotype font to create an unlimited number of images on any surface such as paper, computer screens, photographs, web pages, movie credits, printed material, T-shirts, and other surfaces, where the image has a fixed size. You may use a Durotype font to create EPS files or other scalable drawings, provided that such files are only used by the company or individual licensing the font. You need a special license for using a Durotype font, if it is a primary design element of a product sold for profit, or if it is used for a large scale campaign (advertising, corporate identity design, product packaging, entertainment promotion, store signage). This applies to both in-house and client-based work. Contact Durotype for a special license. You may make a backup copy of a Durotype font (only for the purpose of data backup). You may send a copy of a Durotype font along with your documents to a commercial printer or other service bureau to enable the printing of your document, provided that such party will use the font exclusively for your work and retain no copies of the font on completion of the work. If the printer or service bureau wants to edit your document, it should own a valid license to use that particular font. You may only embed a Durotype font into electronic documents, if it is done in a secured read-only mode. You must ensure that recipients of electronic documents cannot extract a Durotype font from such documents, or use the embedded font for editing purposes or for the creation of new documents. You may not embed a Durotype font into a web site. You need a special license for embedding a Durotype font into software or hardware products in which the font will be used by the purchasers of such products. Contact Durotype for a special license. You may import characters from the font as graphical objects into a drawing program and modify such graphical objects, provided that such objects are only used by the company or individual licensing the font. Other modifications are not allowed. You agree that any allowed modifications are considered derivative works, and that use of such derivative work is subject to the terms and conditions of this license agreement. Except for the provisions of this agreement named ìThird Partiesî and ìEmbeddingî, you may not sell, lend or otherwise transfer a Durotype font to a third party or parties. You may not transfer a Durotype font to a third party or parties as a component or sub-component of other products, e.g. electronic documents or sublicenses. You may not modify, adapt, translate, rent, lease, distribute, produce, reverse engineer, decompile, disassemble, or redigitize a Durotype font. Durotype reserves all rights not expressly granted to you under this license agreement. A Durotype font is solely for use in your own business or for your own personal use, and it remains Durotypeís ownership at all times. Durotype retains ownership of a Durotype font and all subsequent copies of a Durotype font, regardless of the form or media in or on which the original and other copies may exist. A Durotype font and the accompanying materials are copyrighted and contain proprietary information and trade secrets of Durotype. Unauthorized copying of the font, even if modified, merged, or included with other software, or of the written materials, is expressly forbidden. You may be held legally responsible for any infringement of Durotypeís intellectual property rights that is caused or encouraged by your failure to abide by the terms of this agreement. You agree to identify a Durotype font by name, and credit Durotype ‘s ownership of the copyrights in any design or production credits. This agreement is effective until terminated. This agreement will terminate automatically without notice from Durotype, if you fail to comply with any term of this agreement. Upon termination, you must destroy the original and any copies of a Durotype font and the related documentation. This agreement is governed by the laws of the Netherlands. Durotype or its distributor warrants the Durotype product to be free from defects in materials and workmanship under normal use for a period of 21 days from the date of delivery, as shown on your receipt. Durotypeís or its distributorís entire liability and your exclusive remedy as to a defective product shall be, at Durotypeís or its distributorís option, either return of purchase price, or replacement of any such product that is returned to Durotype or its distributor with a copy of the invoice. Durotype and its distributor shall have no responsibility to replace the product or refund the purchase price if failure results from accident, abuse or misapplication, or if any product is lost or damaged due to theft, fire, or negligence. Any replacement product will be warranted for 21 days. This warranty gives you specific legal rights. You may have other rights, which vary from jurisdiction to jurisdiction. Except as expressly provided above, the product is provided ìas isî. Durotype and its distributor do not make any warranty of any kind, either expressed or implied, including, but not limited to, the implied warranties of merchantability and fitness for a particular purpose. The entire risk as to the quality and performance of the product rests upon you. Durotype and its distributor do not warrant that the functions contained in the product will meet your requirements, or that the operation of the product will be uninterrupted or error free. Durotype and its distributor shall not be liable for any direct, indirect, consequential, or incidental damages (including damages from loss of business profits, business interruption, loss of business information, and the like) arising out of the use of, or inability to use, the product, even if Durotype or its distributor has been advised of the possibility of such damages. Copyright © 2010 Durotype. All rights reserved. Aspira: the legible geometric typeface. Aspira is a multi-purpose typeface. It is suitable for both text and display use — for graphic design, corporate identity design, magazines, newspapers, books, reports, advertising, signage, etc. Aspira is a versatile typeface. It offers 112 styles, 8 weights, and 7 widths. It offers 56 upright fonts and 56 italic fonts. It offers lining and oldstyle figures (proportional and tabular). It offers small caps, ligatures, arbitrary fractions, and extensive language support. Aspira is a toolkit for any typographic challenge. Aspira is a geometric typeface. It offers a fresh geometric personality which is pleasant and not too conspicuous. 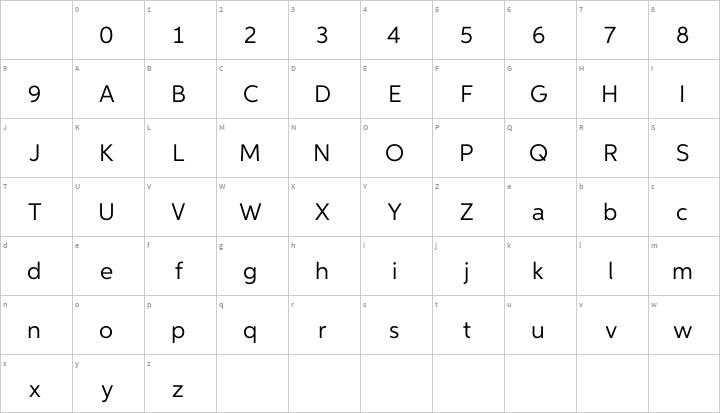 Aspira is a multi-width typeface. It offers 7 widths — much more than what is currently usual. 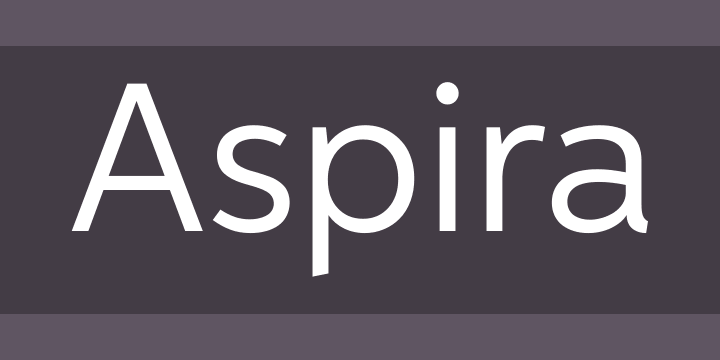 Aspira is a legible typeface. Many of its details, like its open apertures and subtle variations in stroke width, are designed to enhance its legibility. Aspira in use: 1 2 3. For more information about Aspira, download the PDF Specimen Manual.